Too much coffee can be a real problem when attempting to shoot great moving shots with a camera…you need a very steady hand and even that’s not always good enough. For a truly steady and precise shot, a camera mount should be used. Unfortunately, this type of equipment is often really expensive for anyone starting out and creating videos as a hobby. 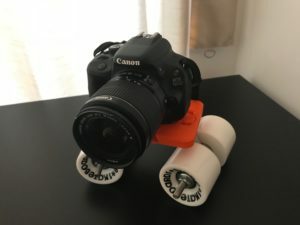 So, some folks at SOLIDWORKS decided to design an awesome DIY dolly using some skateboard wheels, SOLIDWORKS software and 3D printing. To design the dolly, they wanted to use the same shoe as the one used in a previously designed tripod. This would allow them to mount the shoe on the camera and quickly switch it to the dolly if needed. The team started in SOLIDWORKS by reverse engineering the tripod shoe. From there they created a little prototype to see if the shoe fits. They printed out the prototype and it fit like a glove (or a sock) for the shoe. From this model they were able to build the dolly. They decide to use two gears so that when you turn one axle the opposite one will mirror that, allowing you to create smooth turns. When spacing the wheels to ensure that the turning circle was large enough, they used a pattern rotate on the wheels. This allowed them to see what the wheelbase should be. They then added the final details and sent the parts to print. By using SOLIDWORKS and 3D printing technology, the team was able to create an affordable accessory to take new and different camera shots without breaking the bank. 3D printing allows users to create their own unique take on products they wish to own, which are either too expensive to purchase or need adaptation in order to use it in the exact way that they need. To view the camera shots that were created with the DIY dolly, watch the video here. Click here to read more about their project and see pictures along the way. Have questions? Click here and an expert from The SolidExperts will be happy to help you!